Olney Rugby Club has 137 years of history, said to be without parallel in Buckinghamshire, and which few clubs in the country can equal. In these early days there was no playing field available as such. Games were played on farmland meadows. One of the Club's oldest members can recall practices on the Market Square, using a pigs bladder or a hay-filled sprig bag, a small sack used to contain nails used in the local boot and shoemaking industry. The first recorded game in Olney, in 1877, was played on Cherry Orchard, a meadow on the banks of the Ouse, now the Cemetery, and there, where they first took the field to Play, many of the old players lay for their last long "no side". The First World War took a sad toll of Olney players. Sixteen playing members lost their lives, including the great Edgar Mobbs, at this time Captain of Northampton, who formed the Sportsmens Battalion. Mobbs was one of the three Olney players to play for England, as was Dr. Gilbert Bull, who also lost his life. Honours gained by Olney players included the D.S.O. to Lt. Col. Mobbs, D.C.M to G.Bamwell, and MMs to F. Millward and Tom Clifton. A Military International was played on the County Ground, Northampton, between England and Scotland, with Edgar Mobbs as Captain of the home side, in January 1915. The side included Jack GiIlam, Ned Mann and Henry Grierson who also played for Olney. The most colourful of the pre-1914 Internationals from the Olney Club must surely be the legendary Blair Swannell. He lived at Weston Underwood, just outside the town. Whilst a member of the Olney club he also ran his own private team which he named "The Weston Turks", He can still be remembered for playing with bracelets on his arms! Blair Swannell had the unique distinction of being capped for England and Australia. He was a member of the British Touring team to Australia in 1899, which won eighteen of twenty-one games, and the tour of New Zealand in 1904 where all fourteen games were won. He decided to remain in Australia and played for New South Wales in 1905/6 being capped for Australia in that year. The beginning of the First World War was the end of an era for the Olney Rugby Club. A club which had its beginning almost forty years previously, when the gentlemen's sons returning from their various boarding schools for the holidays, called in the gardener, the groom, and the boot and shoemakers to make up a Fifteen, saw them depart, to be swallowed up in the bloody battles of the most horrific war ever known. 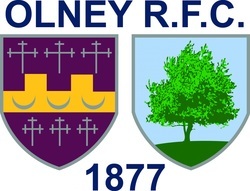 As the larger clubs developed into the present first class club fixture system we see today, Olney, which had been the equal of these clubs, was to settle down in the postwar period to being a top Junior club. Among their fixtures over the years, apart from Bedford and Northampton, have been Harlequins, Blackheath, Old Blues, Old Merchant Taylors, Nuneaton, Leicester, Rugby, Coventry, London Welsh, Stratford-on-Avon, Edgware, Metropolitan Police, Upper Clapton, Leytonstone, Old Paulines, Roslyn Park, Royal Air Force, Streatham, Newbold, Abercarn, Brasenose College, Magdalene College, New College, Oxford and Norwich. Many players have turned out for the East Midlands between the wars. Sam Kitchener played over a period of nineteen years for Bedford, many of those years as Captain. Sam, a man of strong religious principles, turned down a chance to play for England against France because it meant playing on Sunday. In the early 1920's training was often carried out by the light of an oil burning stable lamp. Scrummaging was practiced in the stable yard. The large manure heap helped to produce strong scrummagers. It was not "the weakest to the wall" but "the meek to the muckheap". The mid-wars team reached its greatest heights in the 1934/5 season, winning 26 of its 34 games, amassing what was a colossal total in those days of 711 points, with only 198 scored against. Reg Tompkins scored 40 tries as a wing three-quarter, and Alec Bell 30 from the centre. In the 50th year the East Midlands played Olney as part of the celebrations, on the Recreation Ground, which had now been the regular venue for a number of years. The East Midlands fielded a team having four Internationals. Mr. J. C. Hipwell, the first Captain of the club, kicked off. East Midlands won by 20 points to 5. In October 1935, an East Midland Trial game was played at Olney with Northamptonshire against Buckinghamshire. Six Olney players were involved, R. Tompkins, A. Bell, J. T. Bradley, P.Sowman, J. Packwood and J. M. Mungavin, later of Barts. The club came up to the Second World War, strong, with good quality players and an outstanding fixture list - still running two teams. The effects of the 1939/45 conflict were much the same as in 1914/18. Limited fixtures were played; mainly with local service units, but on the restart there was a dire shortage of players. Few of the players from the pre-war era were able to resume, and those only for a short period. The local school, unusual for a Council School, had always produced players. It no longer played Rugby. There was no follow up of young players. The two teams were composed mainly of returning servicemen who had only played a few games during their service careers, and anyone who could be talked into it, learning as they played. Play was restarted in earnest with the resumption of their strong pre-war fixture list, but with a woeful lack of experienced players. For two or three seasons they suffered heavy defeats from opponents who had the benefit of well-trained and skilled players. Despite the surrender of some of their stronger fixtures the club struggled on, with the players showing tremendous courage and dedication; turning up week after week, defeat after defeat, gradually improving their skills. Many players never reached their full potential, through having to be thrown in against superior opponents too early in their development. Serious consideration was given in the 1946 season to dropping back to one team, but a wise Committee, having seen all this before, launched out instead for a third XV, and brought back into being the Olney Juniors, a team which had existed for a short while many years previously. This difficult period established a spirit of camaraderie which exists to this day. Players who, will turn up week after week, defeat after defeat, are the salt of the earth; Anyone can turn up after winning! The club now began to realise that a shortage of playing space was likely to hold up further expansion, but rugby ceased at the local school, and the supply of players began to dry up. Suddenly, in 1973 Mini Rugby came into being. This proved an immense success with youngsters. At last they could play rugby with four coats to mark the confines of the ground, simplified laws, and a small ball. Lads from six years old to fourteen swarmed on to the Recreation Ground every Sunday morning, where, under the guidance of their enthusiastic coaches, they were graded according to age and size. They met with instant success in tournaments, and soon had a regular fixture list with other local clubs running Mini sections. At last Olney could count on a regular supply of players. With some of the Mini players now experienced sixteen year olds, a Junior Colts XV was formed, and after more than forty years of pushing forward, from 1946 when that decision not to drop back to one team was made, to 1988, the club has progressed to five senior XVs, a Junior XV, and their Mini section.